Discover – A rudimentary beginning to a Klout/social media dashboard. You get an idea of what per cent each social network contributes to your Klout score. For me, I’m about 80% Twitter dominant, and I’d say that’s pretty accurate. Beyond that, there’s not a whole lot of new stuff here. They continue to display your 7-day, 30-day, and 90-day Klout score movement, number of mentions, likes, followers, friends, +1’s, connections, etc. All this is interesting, but not overly helpful. Moments – This is a list of all the interactions your accounts have had over the last 90 days. 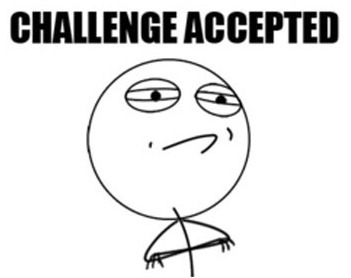 It includes likes, mentions, followers gained, RT, +1 in Klout, and so on. You can scroll back for three months to see what pieces of content were most engaging to your audience. On each “moment” there’s a curious little meter that consists of five green balls. The more engaging your content is, the more balls will be turned green. It’s a decent, chronological overview, but I’d like the ability to sort by highest and lowest ranked pieces of content, rather than having to scroll through and look at them all. 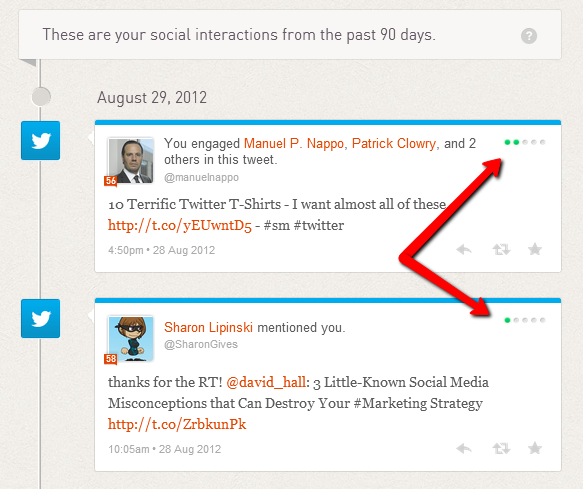 New Klout score – This is probably the most important part of the August 2012 update. Now, Klout uses significantly broader data sets and signals, from less than 100 to more than 400, to analyze and calculate your online influence. They have also increased the number of data points analyzed on a daily basis from 1 billion to 12 billion in an attempt to deliver a more accurate and up-to-date score for Klout users. They now include many more actions from Facebook, Twitter, Google+ and more, and for the first time they incorporate Wikipedia. Klout even published the key things they measure for each network. Here are the highlights (pulled verbatim from this post). Friends: Friend count measures the reach of your network, but it is less important than how your network engages with your content. Inlinks to Outlinks Ratio: Compares the number of inbound links to a page to the number of outbound links. 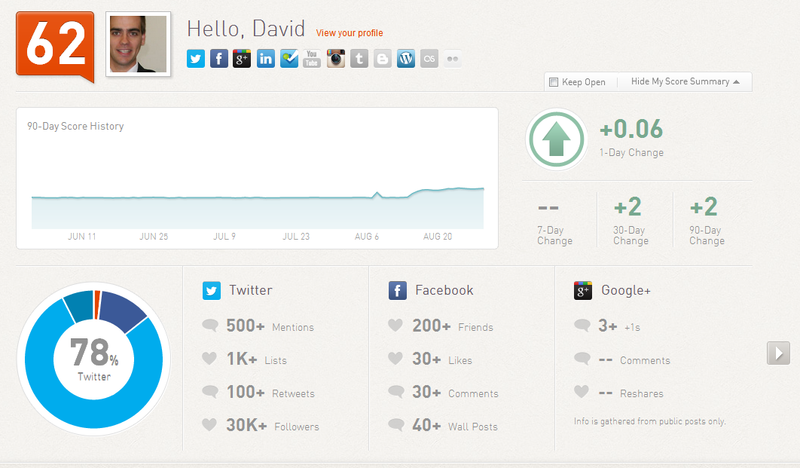 What do you think of the new Klout score and feature roll-out? If your account hasn’t been upgraded, login to preview.klout.com and take a look around. Want to know some stats about YOUR Instagram account? There’s an app for that. Since October 2010, Instagram has been one of the fastest-growing social networks in history. By the end of March 2012, it had about 30 million iPhone users, and, since the release of the app on Android, Instagram user numbers have balooned to 80 million. 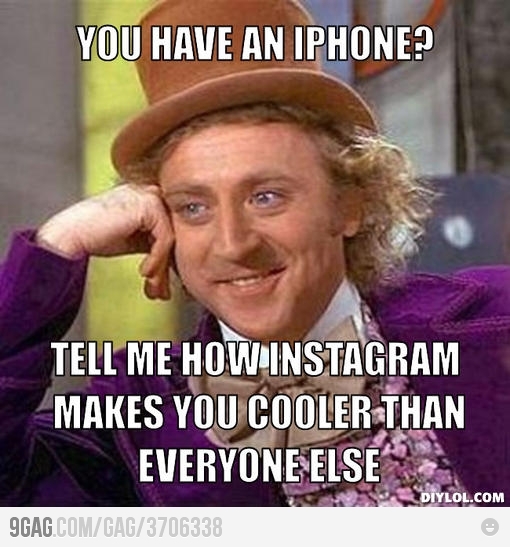 Like all Android users, I’m new to Instagram but really enjoying the experience. After getting to know the tool a bit, I began to think that it was missing two things. First, a browser-based interface that would allow the user to manage photos, comments, likes, and account settings from a laptop. Instagram users know that almost everything usually has to be done with your smartphone, which isn’t always the easiest task. The second thing about Instagram that left me wanting more was a lack of stats. Initially, I went searching for the “total views” a photo had received Knowing this stat would give me an idea of the types of photos my followers are most interested in, and also how successful my sharing tactics are. They even have extra functionality that includes: the ability to create a Facebook Cover image out of your instagram photos, Instagram follow buttons for your website / blog, an RSS feed, a public URL, and a toolkit for brands to help them setup and monitor photo contests. And it turns out that I’m not the only one looking for the functionality and statistics Statigr.am offers: just last week they announced that they have reached the 1 Million user mark and are still growing. Let me know: Do you care to learn more about your Instagram stats? UPDATE: Since the publication of this post, Statigram changed its name to Iconosquare. A simple Google search to see what results come up when your name is punched into the worlds biggest search engine – It’s just a smart thing to do. Feel free to head over to Google now to do a quick search…I’ll wait…Did you like what you found? 79% of HR recruiters and hiring managers screen job candidates by reviewing online information about them. 86% of hiring managers have told candidates that they were rejected based on what was found online about them. Even 12% of College admissions officers said that posts which include photos of alcohol consumption, illegal activity, and the use of vulgar language have negatively impacted a potential student’s chances in being granted admission. Googling yourself isn’t about vanity, egotism, or a sense of self-importance. It’s about ensuring your online presence is an accurate representation of who you are personally and professionally. You wouldn’t submit a resume without proofreading it, so it just makes sense to take a few moments each month to Google yourself and “proofread” the information available about you online. If you don’t like what you see, you can take steps to remove questionable posts/photos and change your online behaviour going forward. It’s better to start now than to wait until you are actively looking for a job. For some additional facts, stats, and tips to help you find out what the internet is saying about you, check out the infographic below from www.backgroundcheck.org. IMPORTANT NOTE: This infographic asks you to log out of Google to get “unbiased results”. It is true that this will disconnect the search results from any information Google has stored about your Google Account. But Google also uses third-party cookies that your browser has stored to customize your results as well. To turn off both of these customizations at the same time, all you have to do is add the simple “&pws=0” URL parameter to the end of your search URL, hit enter, and you will see the results most people on the web will see. The URL should then look something like this https://www.google.com/search?q=Your+Name&pws=0. Big thanks to colleague @erichollebone for sharing the URL parameter tip.